NutriSource pet food has created high quality food that provides whole body nourishment for your beloved pets. A deep-rooted sense of family, community and integrity guides every decision, from the top to the bottom. NutriSource's top priority is to deliver the safest, most nutritious foods possible. They take the time to examine all raw ingredients and test every product during and after cooking. 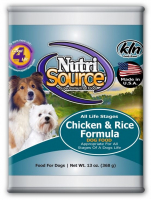 NutriSource provides a variety of options for dogs and cats! Specific formulas are curated for your pet’s needs. Small and Large Breed options are available to compliment your pet’s size. Puppy, Kitten, Adult and Senior recipes so you can tailor nutrition at any life stage. Grain Free and Specialty Protein options are also available to ensure that any nutrition or allergy concern can be met with a healthy solution. Check out our NutriSource blog to learn more about this great food, and what goes into it!